Diversity matters. Politics matter. The conduct of the publishing community matters . . . but the current climate in our YA community had made them feel like they didn't matter. - Four were written by young women of color. - Two stated outright that they didn't feel comfortable even asking questions about books because of the way they'd seen friends, bloggers, and authors treated if they phrased a question "wrong", or the question implied they disagreed with leaders in the community. - One had stopped blogging completely because she was afraid a wrongly worded review might make her a target. As a YA author, this left me incredibly disturbed. 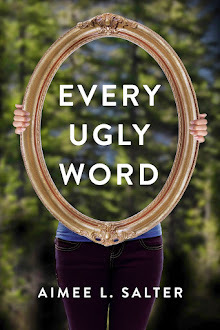 All of us in the YA community (yes, even those who may intimidate you) got into this arena because we want to connect with young people. We want to be a support and encouragement to young adult readers. We all believe that books, and access to information, are a critical freedom, even for minors. Helping young people feel empowered, learn, and grow is why we're here. So, if you've felt targeted, de-powered, or threatened in our community, I'm sorry. And I want you to know: You're safe here. You're allowed to disagree. You're allowed to be resolute in your choices -- even if your thoughts, feelings, and opinions don't match mine. In fact, we can be diametrically opposed, and I'll still welcome your questions and discussions. Because I know the only way to learn and grow is to be allowed to ask Why and How? The only way to influence or be influenced, is through calm discourse that analyzes the issue (not the individual). And the only way we can truly stand alongside each other is to accept that sometimes we won't see eye-to-eye. And neither our persons, nor our mutual relationship, is devalued by that. So, I'm making a commitment to you: If you want to discuss a book (any book), you can ask your question here. I've placed moderation on the comments so no one will be able to answer your question rudely, or with insults. Every opinion that's worded respectfully--even those I disagree with--will be published. If no other readers can answer your question, and I'm not able to, I'll find someone in the know to do it with respect. MY COMMITMENT: You will not be insulted, ridiculed, diminished, or marginalized by your conversation here, on any of my personal social media platforms, or in private correspondence with me. 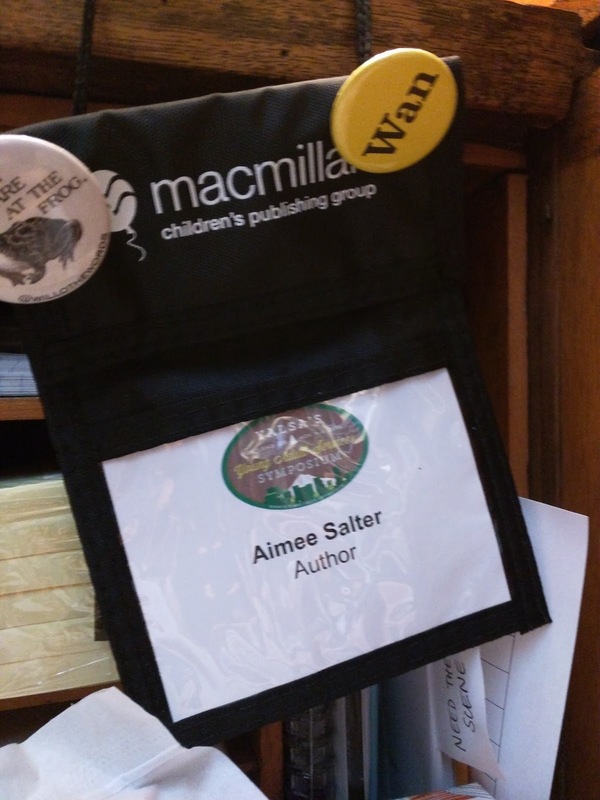 If you have a question about any book or issue in the YA community that you don't feel comfortable asking publicly, either comment anonymously, or email me. My contact details are available in the header of this page. If you find yourself in the middle of an online storm that you didn't see coming, tag me, tap me, or ask for my help. You don't have to weather that alone. And if anyone is abusing you--verbally, emotionally, or physically--that's never okay. No matter what issue is at stake. Talk to me, or another adult you trust. You do not have to accept that. Period. Have no fear. You're safe here. 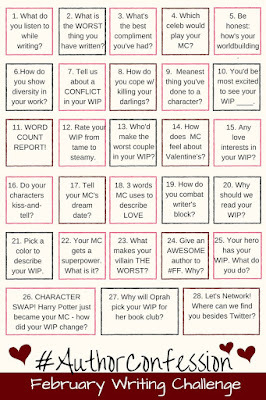 Author Confession - Day 3 - What's the best compliment you've had? I'm a day behind, but I didn't want to skip this one! #AuthorConfession Day 3 "What's the best compliment you've had?" There's no doubt that most authors prize the letters, emails, comments from readers who've connected with their books above all other accolades. Knowing a real, live person has read your material and it's found a place in their heart or impacted their life is literally incredible. It's those moment's I've dreamed about since I was a teenager. While I signed books and met readers, I noticed a young woman, probably in her early to mid twenties, standing off to the side, a few feet away from my table, staring. At first I thought she was in line to meet the author next to me as she stood closer to that line. But her back was to the people lined up. Was she trying to read about my book? Or just distracted? Then as my line dwindled, she stared right at me. A minute later I reached a lull and turned to smile at her. Did she need help? She gripped the straps of a tote bag with white-knuckled fists and seemed to shrink in on herself. But when I smiled at her, she walked hesitantly up to my table, no longer meeting my eyes, instead digging in her bag. "I-I have your book already. Will you sign it for me?" I was flattered. "Of course." Her hands shook as she passed me the book and I realized she wasn't distracted, or uncertain. She was terrified. (Of me? Of the crowd? Who knows). Painfully shy, she'd been standing off to the side trying to drum up the courage to come to my table. She'd been waiting for there to be no one else in line. While I wrote a pithy dedication in her book and thanked her for bringing the book, she stepped close enough to lean slightly over my table. Her voice was barely above a whisper. "I already read it. I w-wanted to thank you for writing it. It . . . it really helped me. I kn-know you were bullied." She wasn't the first reader to communicate this, but I'm always grateful to hear it. I met her eyes, smiled widely and thanked her, sincerely. Then she said, "I came here to meet you because I wanted to tell you I think it's a really important book." I was stunned. I'm pretty sure I stumbled over something very insufficient, like, "Wow. Thank you! Were you bullied too?" She nodded, but didn't say anything because a handful of new readers chose that moment to arrive at my table. They respectfully gave her a few feet of space, but their movement and hubbub behind her caught her eye, then mine. I glanced at them over her shoulder, then turned back to speak to her again, still fairly dumbfounded. What was her story? Was there something specific that had resonated for her? But I never found out because she gave a shaky little wave, turned her back and walked away. I still have moments where I wish I could find her and talk to her--not so she could tell me about me, or my book. But because I was so touched by how clearly difficult it was for her to be there, to be surrounded by people. Yet she'd urged herself to come to talk to me. It was easy to see the pain and fear in her eyes. I wish I knew her story. I wish I could encourage her, and befriend her, and support her through what is clearly a life that remains somewhat traumatic. Instead, she gave me the best compliment I've received yet. And I'll always remember her. 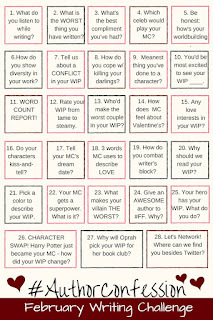 Author Confession Day 2 - What's the WORST Thing You've Written? 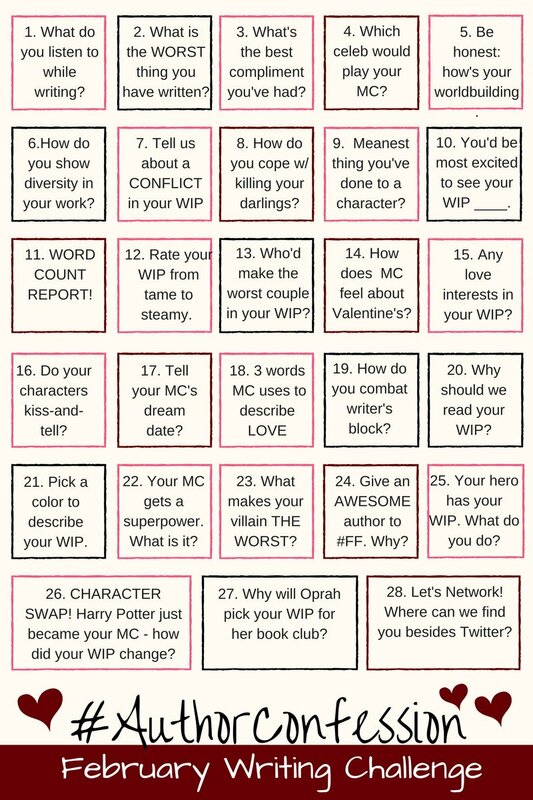 For the month of February I'm taking the #AuthorConfession challenge. Day 2 is "What's the Worst thing you've written?" This one has been kind of fun for me. I went back through my backup files to find the original version of my very first book. It isn't without potential, but some of my descriptors and internal narratives are cringe-worthy. "As I stepped up the center aisle I peeked out from under my bangs to see if I could identify the person I’d be spending a semester copying from and found myself frozen in the glorious gaze of Carl’s warm brown eyes. I swallowed again, this time to move my heart back down to its correct anatomical position. I tried not to walk faster, but the relief was overwhelming. Carl saw me coming and smiled, which required another severe swallow to keep my heart in place." "Michelle couldn’t believe it when Carl took his shirt off. He was such a show-off! And she hated how her pulse raced and her stomach starting flipping around as she took in the perfection that was everything about him. She swallowed hard and glared to hide her attraction. He needed to get a grip!" Lesson? Adverbs, exclamation marks, and purple-prose do not a compelling story make. My characters sound years younger than they are, and the descriptions of around around them often sound as if they fell out of a ridiculous SNL sketch (not the good ones). When it comes to descriptors and scene setting, less is more, Aimee. Less. Is. More. I ran into this on Twitter and thought it would be a fun way to reconnect. Day 1 is pretty easy for me: I create playlists for every work in progress as soon as I'm sure it's a story I'll pursue to completion. Current protagonist and the tone of the book lean heavily towards Blink 182 and Green Day.